Bishop Michael E. Hill, Sr. The call of God was evident upon Bishop Michael Eugene Hill, Sr. from early childhood. As a son of the Church of God in Christ, the Lord’s hand rested heavily upon him as he was being prepared for the ministry. Throughout each era in his life, God was priming him for a divine purpose. Bishop Michael Hill Sr. is a native of Detroit, Michigan. Upon completing high school, he attended Detroit College of Business and Highland Park Junior College majoring in accounting. He also attended Saints Junior College in Lexington, Mississippi. Bishop Hill’s father, Bishop Robert Hill, was an exceptional man of God, and both his father and his mother, Mrs. Cozette Hill, have played a very influential and nurturing role in his life. After the demise of his father in 1986, Bishop Michael Eugene Hill Sr. assumed leadership of Kingdom International Church of God in Christ. Bishop Michael Eugene Hill Sr. has moved the church forward introducing innovative and exciting changes into the ministry that have ignited and propelled it to new heights, and inspired countless people of various nationalities. A highlight of his work came in 1997 when he led the church into its new edifice located in Dearborn, MI, this being the first African American church to locate into that city. Bishop Michael Eugene Hill Sr. presently serves faithfully in the Church of God in Christ at various levels. In November, 2011, he was officially installed as the Jurisdictional Prelate of the Great Lakes First Ecclesiastical Jurisdiction of Michigan following the demise of Bishop Clifford C. Dunlap. Prior to this God ordained elevation, Bishop Hill served as Superintendent of the Deliverance District, Administrative Assistant to the Bishop, and Chairman of the Finance Committee for the Jurisdiction. Internationally, Bishop Michael Eugene Hill, Sr. served as President of the International Youth Department from 2004 – 2008. He also serves the local community as a Chaplin for the Wayne County Sheriff’s Office. Bishop Michael Eugene Hill, Sr. has been the loving husband of Missionary Pearl Hill for over 37 years. 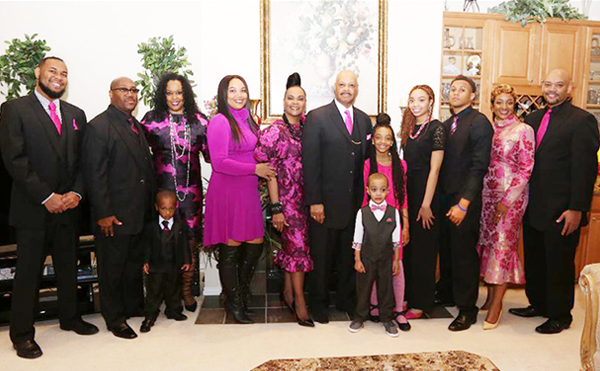 This loving union produced two beautiful children and five wonderful grandchildren: a daughter NaKisha Hill and her children, Dwight III, Micah, and Christian; and a son, Michael E. Hill, Jr. (Katrina) and their daughters, Kyla and Keliah. His devotion and love for his family is perpetually evident and divinely reminiscent of the love that Christ shows to the church. Bishop Michael Eugene Hill, Sr. is a very talented and anointed man of God who harbors the musical ministry gifts of singing and playing the organ; gifts that were imparted to him as a young boy. However, God, in his infinite wisdom, saw fit to elevate him from the soft touch of the ivory to the realm of spiritual warfare. Bishop Michael Eugene Hill, Sr. believes in preaching and teaching the Word of God and empowering the people of God to live according to Kingdom Principles. He has dedicated his ministry to meeting the needs of the total man; studying daily and searching the scriptures for fresh bread to feed God’s people. His unique outlook on life in the Kingdom of God effortlessly attracts people of all ages, ethnicities, and backgrounds affording him the opportunity to plant the seed of the Gospel of Truth across the United States. Bishop Michael Eugene Hill, Sr. credits the depth of his love for family and people, the foundation laid by his parents, and his strong roots in the church for being the core of the phenomenal success he’s experienced in his ministry.